25 Acres (more or less - from Tax Bill) of undisturbed land fronting on seasonal section of Cape Road. Mixture of hardwood and softwood bush. Great recreational parcel. Good hunting in the area. Mainly level however the South of property rises steeply (Escarpment) to Georgian Range Road (also seasonal access road). No real access to the property from Georgian Range Rd. due to the steep fall off. Just over 3 kms. 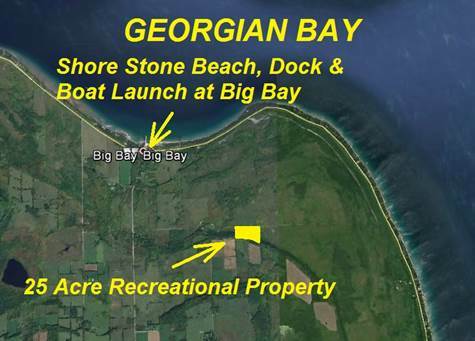 to Big Bay General Store, Municipal Dock, boat Launch and shore store beach. About half way between Wiarton and Owen Sound. There are permanent homes along Cape Road but currently the road to this property is not maintained by the township. Information is provided as an estimate only and deemed to be correct but not guaranteed. Please use accordingly.